We cruised with another couple on Holland America for the first time this past September. We had read that the Zuiderdam had had a major face life last spring, but it must have been for the public areas, not the staterooms. The staterooms appear to be circa 1980s? Don&apos;t get me wrong - our suite had LOTS of room and the bathroom was the largest I have seen on a ship - double sinks, separate shower from the jetted tub. Very nice! The room though, was obviously older with dated tile needing some caulking and the color scheme was definitely not current. They swapped out the balcony furniture during the cruise - the new furniture was much nicer! The cruise itself was wonderful. The staff could not have been friendlier or more helpful. We started to wonder if they ever had a bad day! Always a smile on their face! We embarked from Venice (spent two days there before the cruise) and had stops in Olympia, Athens, Mykonos, Santorini, Rhodes, Naplion, Ephesus, Naples, and Rome! Each stop was unique and amazing! The process for boarding the ship the first day is much smoother than some of our previous cruises on different cruise lines. Same with disembarking at the end of the cruise. They know their stuff! We enjoyed the special guests (singer and a comic/magician) they had in the Lounge during the cruise. Both brought a lot of energy to the stage and the audience was delighted! The Zuiderdam singers and dancers were not exceptional however. (Reminded us of our kids&apos; high school show choir.) We also enjoyed a couples massage and a "gambling lesson" as part of a package our kids bought us for our anniversary. We did these on our "at sea" day which was perfect. I had read reviews about the dining onboard the Zuiderdam and had been a bit concerned. Turns out I had no reason to be concerned. Every meal was delicious and served by a friendly staff. We chose the open dining option and had different servers every night. All were professional and very friendly. They always had plenty of delicious selections each evening and so no one at our table had any problem getting something they really liked. The biggest con was their alcohol policy. You are limited to bringing two bottles onboard and those are subject to a corking fee. Whenever you order a drink of any kind, there are added hidden charges that bring the cost of the drink up to a ridiculous amount, Happy Hour seems like a deal until you see all the fees added per drink. Would rather they be included in the price so there are no surprises when you get the bill. Part of the package we had included dinner in the acclaimed Pinnacle Grill. The meal was paid for so we ordered two rather inexpensive glasses of wine. We thought the bill would be around $30.... It was $54 after the fees were added! And to be honest, the meals in the dining room were equally as good as the Pinnacle Grill. Would stick to the dining room in the future. Full disclosure- did not know that the dining room was serving surf and turf (lobster tail) the night we had reservations for the Pinnacle Grill.....Would definitely have changed our reservations! Loved the cruise and loved the itinerary. Only thing I wish was different - would have loved to have spent an evening in Mykonos or Santorini.....would imagine watching the sun set over either place would have been magnificent......would have loved to have been on a beach in Greece at sunset. We were always at sea by then. We cruised with another couple on Holland America for the first time this past September. We had read that the Zuiderdam had had a major face life last spring, but it must have been for the public areas, not the staterooms. The staterooms appear to be circa 1980s? Don&apos;t get me wrong - our suite had LOTS of room and the bathroom was the largest I have seen on a ship - double sinks, separate shower from the jetted tub. Very nice! The room though, was obviously older with dated tile needing some caulking and the color scheme was definitely not current. They swapped out the balcony furniture during the cruise - the new furniture was much nicer! The cruise itself was wonderful. The staff could not have been friendlier or more helpful. We started to wonder if they ever had a bad day! Always a smile on their face! We embarked from Venice (spent two days there before the cruise) and had stops in Olympia, Athens, Mykonos, Santorini, Rhodes, Naplion, Ephesus, Naples, and Rome! Each stop was unique and amazing! The process for boarding the ship the first day is much smoother than some of our previous cruises on different cruise lines. Same with disembarking at the end of the cruise. They know their stuff! We enjoyed the special guests (singer and a comic/magician) they had in the Lounge during the cruise. Both brought a lot of energy to the stage and the audience was delighted! The Zuiderdam singers and dancers were not exceptional however. (Reminded us of our kids&apos; high school show choir.) We also enjoyed a couples massage and a "gambling lesson" as part of a package our kids bought us for our anniversary. We did these on our "at sea" day which was perfect. I had read reviews about the dining onboard the Zuiderdam and had been a bit concerned. Turns out I had no reason to be concerned. Every meal was delicious and served by a friendly staff. We chose the open dining option and had different servers every night. All were professional and very friendly. They always had plenty of delicious selections each evening and so no one at our table had any problem getting something they really liked. The biggest con was their alcohol policy. You are limited to bringing two bottles onboard and those are subject to a corking fee. Whenever you order a drink of any kind, there are added hidden charges that bring the cost of the drink up to a ridiculous amount, Happy Hour seems like a deal until you see all the fees added per drink. Would rather they be included in the price so there are no surprises when you get the bill. Part of the package we had included dinner in the acclaimed Pinnacle Grill. The meal was paid for so we ordered two rather inexpensive glasses of wine. We thought the bill would be around $30.... It was $54 after the fees were added! And to be honest, the meals in the dining room were equally as good as the Pinnacle Grill. Would stick to the dining room in the future. Full disclosure- did not know that the dining room was serving surf and turf (lobster tail) the night we had reservations for the Pinnacle Grill.....Would definitely have changed our reservations! Loved the cruise and loved the itinerary. Only thing I wish was different - would have loved to have spent an evening in Mykonos or Santorini.....would imagine watching the sun set over either place would have been magnificent......would have loved to have been on a beach in Greece at sunset. We were always at sea by then. A friend recommended PK Travel to us and she was right! This is the BEST way to see Athens! We booked online and found the process to be very easy. Potoula sets up the tour and is very easy to communicate with via emails. We had an amazing tour with our guide, Michael! (Our driver, Tolis, was also wonderful. He always had a bottle of water waiting for us when we returned to the car before heading out to our next stop. Both Michael and Tolis have a great sense of humor and were fun to be around all day!) The four of us have agreed that the tour offered by PK Travel was the BEST one we took during our 3 weeks in Greece and Italy - and we took a lot of tours! Michael is so knowledgeable in all things Greek and he presents the information in a way that is entertaining, yet informative. We packed so much into our one day there that I feel like we were there longer. They got us to the Acropolis early in the morning before the crowds arrived, which was awesome! We saw the changing of the guard when we first arrived. Before the day was done, in addition to the Acropolis, we had seen The Panathenaic Stadium, The Temple of Zeus, the Greek Agora, the Plaka, and the New Acropolis Museum (which is worth the trip alone!). We also drove by several other sites including the Neoclassical Trilogy. I will definitely be recommending PK Travels to friends traveling to Greece! Small family run Olive Farm that produces olive oil! They met us off the bus with a glass of white wine! How can you not love it?! We were then taken over to a group of chairs in the shade to listen to a brief presentation on how olives are harvested and then eventually made into oil. Fascinating. Later we were taken into a dingy area for some amazing appetizers paired with a delicious red wine. Plenty of food and drink for all. This was followed by a demonstration of Greek dancing before all of us joined in on the fun. Great afternoon ! The guide that met us at the port is a family member and was a lot of fun! We all called her a Greek Sandra Bullock. Trust me - she has heard that before! She was a lot of fun and very entertaining! Amazing history! Visited The Virgin Mary&apos;s House and the ancient ruins of Ephesus. Great guide - with a great sense of humor. Enjoyed our time much more than expected. Fascinating area. Could have skipped the last stop in Kusadasi though. They drop you in front of a carpet weaving shop for a demonstration on how they make Turkish rugs. It is really a stop to strong arm you into purchasing a rug from them. Don&apos;t think they had any takers, but we did not appreciate the way this stop was presented. My advice.....get up and leave as soon as the sales pitch starts! No need for an excursion here! Beautiful village with lots of places to walk and take in the beauty of the area. The windmills, the shops, the cafes......are everything you&apos;d expect them to be. Just enjoy! We did a private tour of Sorrento, Positano, and Pompeii through seeamalficoast.com (Recommended by Rick Steve&apos;s). Perfect! Very easy to set up through their website. This was a full day excursion along the magnificent Amalfi Coast and our guide Mario was the best! He met us promptly at the port in Naples and drove us along the coast, stopping along the way for pictures and the history of each location. He was fun and very informative. We hired a separate guide for Pompeii (Antonio) which proved to be another great decision. You can tour Pompeii on your own, but with a guide you are given information that makes what you are seeing meaningful. (The guide was scheduled through seeamalficoast.com. All we had to do was show up!) We saw so much in 8 hours with the personalized attention they had promised. Mario even set up lunch for us after we asked him to recommend a non touristy restaurant. It was delicious and off the beaten path. There were four people in our group. We all agreed at the end that it had been worth the price. Much better than a bus ride with 30+ people. Highly recommend this company! An easy walk from the port. Walked around the castle - interesting, but we have seen a lot of medieval castles over the years so in hindsight, would not pay to see this one again. Very hot the day we were there so only spent a few hours walking around before heading back to the ship. We disembarked in Rome and spent a few extra days seeing the sites of this magnificent city. We had been before so we enjoyed relaxing and taking in the sites near our hotel (Hotel Barocco). 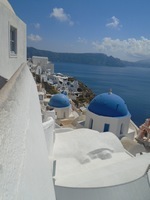 Fun way to experience Santorini and Oia! Guide took us by bus to the Santos Winery for wine tasting and an overview of the winery. Afterwards we were taken to Oia and Santorini for a walking tour and shopping. We had a late lunch before taking the cable car back down to catch the tender back to the ship. Beautiful stop! Love Venice! We enjoy just walking around and taking in the sites! A coffee sitting on San Marcos Square is a must! Forget the price - just soak it all in! We also took a water bus to Murano and Burano. We had been there 20 years ago and thought we&apos;d go back. Murano had glass making factories and Burano is known for its lace. Love the colorful buildings in Burano! Spent more time there than Murano.....fun to walk around and take in the different kids of lace shops. Plenty of tours available, but you don&apos;t need to do them, though the one for the Dogges Palace (for those who have never been to Venice) is well worth it.